Android, undoubtedly is the most popular Operating System for smartphones as it has the largest variety of apps and games. 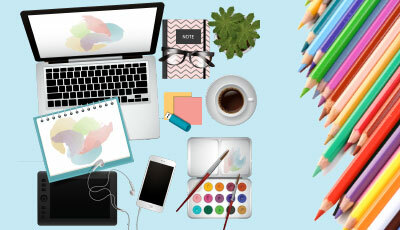 If you do not own an Android device, you can still enjoy the Android experience on your Windows or even Mac PC or laptop with Android Emulators. Game developers install Android Emulators to test apps or games, before they are officially released in the market. Gamers may also like to install android emulators as they enhance the gaming experience and let you control the game with mouse or keyboard. Or users may simply install them to manage and organize their smartphone, to backup or transfer phone data or to download a larger number of apps and games than the phone memory allows. The name ‘app player’ is given to emulators for precisely his reason. Emulators also enable you to sync applications and games on your Android phone with your computer. An emulator is a program that allows a host system to perform the functions of and act like the guest system. 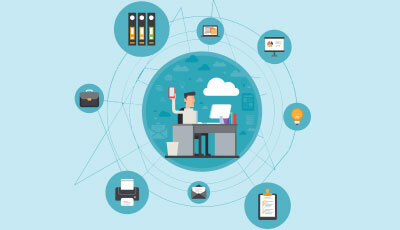 This means, even if an Android smartphone or tablet is not connected to a Windows computer system, you would still be able to run Android on it. 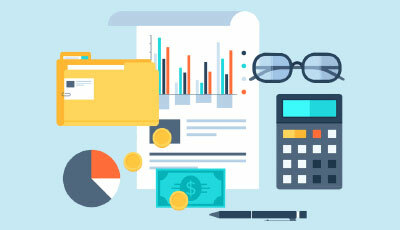 Thus, you would be able to download unlimited applications from Google Play store through a virtual Android device that will be displayed on your computer screen. So, your personal computer would run Windows OS as well as Android OS together. There is a vast variety of Android emulators available out there. But each one weighs over the other in some or the other aspect. Listed in this article are top 5 Android emulators for PC, along with their unique features and drawbacks, if any. We place Bluestacks Android Emulator for Windows PC on the topmost rung for the simple reason that it is the 1st choice of more than 130 million people around the world. It has won millions of hearts due to some of its exclusive features that are ay not be present in other Android emulators. 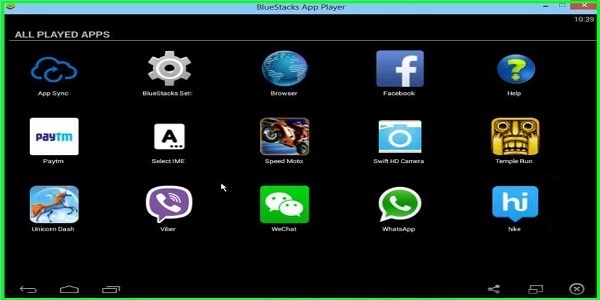 Bluestacks makes it possible to use WhatsApp from your PC and stay in touch with your friends anytime. Send or receive WhatsApp messages, pictures and videos on / from your desktop. With its latest “Layercake” technology, even the most graphics-intensive games run seamlessly on your desktop computer or laptop. It gives the pleasure of full-screen viewing and enhances the gaming experience. Imagine playing Clash of Clans on your PC! Easy Installation & Set up – Bluestacks is easy to install and can be installed in a single click on Windows OS. You simply visit Bluestacks website and download the application from there. Next, install it, and you are good to go. It has split-online installer as well as offline installer for low internet connectivity. 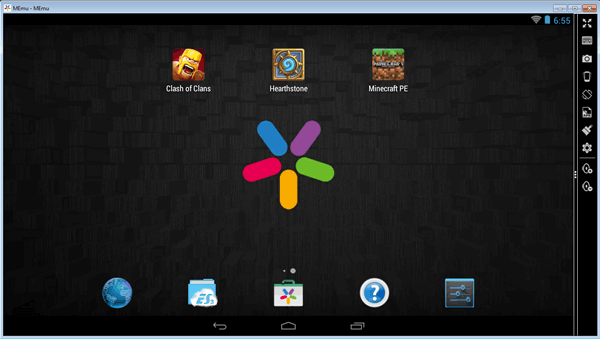 Bluestacks Android Platform has over 1.5 Million apps and games. User-Friendly – Bluestacks has an excellent interface. You can browse, select and install a large number of games. Installed games can be accessed from the bar at the top of the home screen. You can also download applications through Bluestacks and install directly from the Google Play Store. 3rd party APK’s – Installing 3rd party APK’s and Android apps is simple with Bluestacks. Just double-tap on the APK files to install them. This rules-out the need for other 3rd party virtualizations such as VirtualBox. Multi-task: Using your Android Smartphone on your PC means, you can use more than 1 app at the same time. For example, you could be playing a game and also receiving messages on Whtsapp chat. On the downside, productivity features in Bluestacks are a bit sluggish so it would be a good idea to download some productivity apps. Our No. 2 choice is GenyMotion, an advanced Android Emulator for PC. An area in which it supersedes Bluestacks is speed. It has been constructed on x86 Architecture, which makes it faster than Bluestacks. 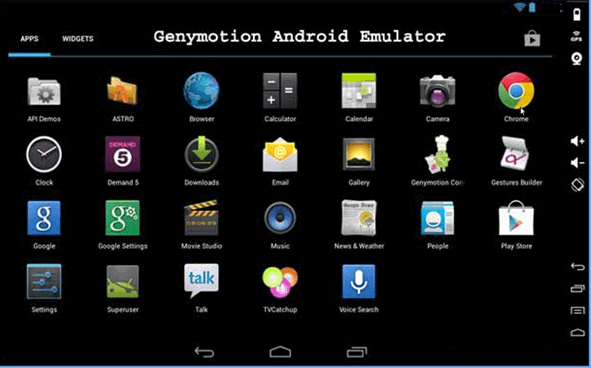 After installing GenyMotion in your Windows PC, you will be required to configure your Android device to it. It is well adapted to Linux and Mac OS, besides Windows. GPS: For Apps that have been developed, asedd on Google Location, GPS widget works perfectly well. Camera: Turn your laptop webcam into the Android video source. Plugins: Use plugins such as Eclipse and Android Studio and Testing tools like Android SDK tools effortlessly with GenyMotion. Browser Compatibility testing: A website may not run as efficiently in one browser, as it does in another. 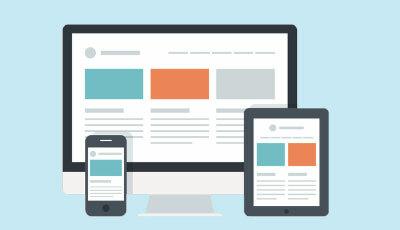 GenyMotion lets developers test run websites in different browsers. Copy and paste text from your windows desktop computer into GenyMotion emulator or from the emulator on to your PC. Apps can be installed either using command prompt or drag and drop feature. OpenGL and hardware acceleration support are some of the advanced features of GenyMotion. One limitation however is that you will require installing Virtual Box on your system to run it. No. 3 free emulator on my list is Droid4x Android Emulator. It gets points due to its performance, UX , user-friendly interface, compatibility, gaming controllability and graphics. It has larger number of features as compared to any other PC Emulator. It is so closely integrated with Android device that all that you do with your mobile can be done on your PC. The Droid4x performs wonderfully. It has amazing gaming experience, with bigger Screen and faster performance, which is better than any other android simulators in the market. It also delivers amazing graphics experience. N fact, great graphics can said to be it’s greatest plus. Droid 4x is the first simulator that supports multi-touch. With it, you can control any game or app from your Android Mobile. This means, your mobile becomes your game controller and even lets you play motion games on your desktop computer and have a better experience than playing on the phone.. This feature works wonders for gamers. They can also use computer keyboard or a joystick to play and control games. This is not all! It is possible to configure the keyboard controls. Mouse scroller can be used to Zoom in or zoom out. Some of these features may need to be installed. This is a really cool feature. While playing the game or using an app, You can record the screen and share on your social networks. For Android apps that involve shaking the mobile, Droid4X Android Emulator has a ‘shake’ option, that works as well. Droid4x Android Emulator can be adjusted to any size. Enables you to use Copy and Paste command between the PC and the emulator. No. 4 on our list is the free emulator Andy. It runs almost all types of Android apps such as productivity apps, launching apps and gaming apps. It bridges the gap between your Pc and mobile phone. It also lets you install root access, if required. Andy offers an all-rounded experience to users for using games and other apps. It is stable but can get slightly slow at times. With Andy, you can easily use third party launcher and widgets. Gaming Emulator: Andy is ideal for gamers as it is primarily designed for playing games on larger windows screen. Easy mobile Control: You can take complete advantage of the multi-touch or gyro elements of gaming. Control the screen with your mobile, using it as a joystick or a controller, as we saw in Droid4x. However, Andy was the first to come up with this feature. Install through Browser: This is indeed the best and most useful feature of Andy. It enables you to directly install any application to your Andy emulator through the desktop browser of your host. Provides smooth synchronization between desktop and mobile devices that enables you to operate your phone, without even touching it. Compatibility: Andy Is 100% compatible with your PC and gives you the choice to play all the popular mobile games on your PC. Launches push notifications and also provides boundless storage capacity to users. On the downside, installation may not be as simple as Bluestacks and you will have to install a virtual box to use Andy. Also, it does not support Multiplayer mode. 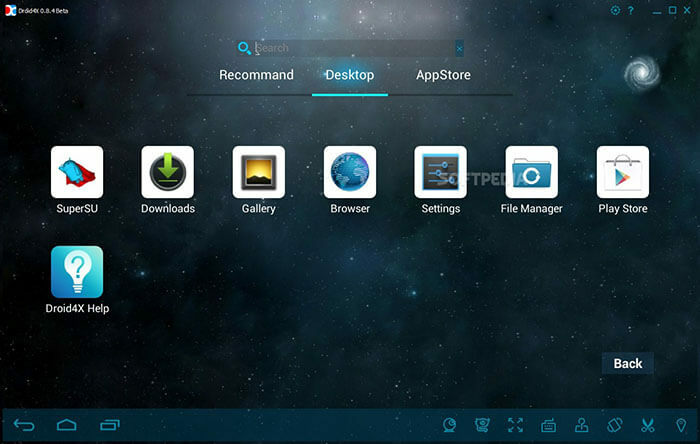 The last but definitely not the least on our list is MEmu– free emulator for Windows PC. Its USP is its ability to run your Android smartphone apps and applications, not only on your Windows desktop or notebook but also on other Windows devices such as tablets. With MEmu, you can run Android on Windows platform, without the need to install any other OS. MEmu can be easily installed on your PC and run your apps without any hassle with a single click or tap. Customization: You can customize the various specifications such as the memory, root mode, CPU etc. Controller Mapping: Use mapping resolution to map a controller like a joystick or keyboard and enrich your gaming experience. Multi-Window: MEmu allows you to multi-task by opening multiple MEmu windows. You can watch live Television while playing your favourite games. GPS: Uses GPS location to enable sharing of files between Android and Windows. Multi player Mode: Lets you easily create as many players as you like. Plug & Play: You can plug & Play MEmu with its portable version which allows you to launch MEmu from a USB port without needing to install any software..
Android system creation: Create a new Android System with a single mouse click. This feature lets you to create, delete or run various functions on Android simultaneously. Installing APK cannot get simpler than this! Install APk just by using drag and drop feature. Some other Free Android Emulators that I would have liked to include in this list are: Windroy, Youwave and Nox. As mentioned before, there is no dearth of Android emulators out there, but what you pick, solely depends upon your requirement. Whether it is playing games or developing and testing a game that is your prime motive; whether you are looking for heavy performance or a light weight system; whether easy installation means more to you than ease in downloading apps: these factors that will largely influence your choice of emulator. Hope this information helps you to pick one that best suits your purpose.